“A clean tooth will not decay” stated J. Leon Williams, first president of the American Dental Association1. According to The American Journal of Clinical Nutrition, “oral hygiene is sufficiently effective to prevent dental [cavities] caries,” however, “it is unrealistic to assume that simple brushing alone will prevent dental caries”1. Other factors such as eating frequency, nutrient properties of food and beverages, and oral hygiene habits also play a role in determining dental caries (cavities) risk. Avoiding tooth decay and erosion through dietary habits has many benefits, including less painful and costly dental treatment procedures. Diet has an regional effect on oral health, primarily on the structural integrity of the teeth, pH levels in the oral cavity, and composition of the saliva and plaque. Nutrition has an overall effect on the integrity of the teeth, gums, oral mucosa and jawbone. Therefore what we consume on a daily basis, diet and nutrition, and the frequency of those dietary habits can play a considerable role in our overall oral health. What Causes Tooth Erosion and Tooth Decay? Tooth erosion and tooth decay are caused by different factors—it’s important to understand the differences in order to take the right preventive measures to keep your mouth healthy for the rest of your life. Tooth erosion “is the progressive loss of dental hard tissue [enamel and dentin] by acids in a process that does not involve bacteria or sugars”1. The acids from frequent dietary practices, such as consuming soft drinks and juices, may cause tooth erosion and can weaken the structural integrity of the tooth. What we consume can cause an imbalance of the pH levels in the mouth and can cause the mouth’s acidic levels to be high, causing tooth erosion over time. Tooth decay, also known as dental caries, is the destruction of tooth enamel and dentin (the bulk of the tooth) from infectious bacterial organisms that thrive when protected by a layer of hardened plaque. The presence of sugars in our foods and beverages, naturally occurring sugar and added sugar, is what causes tooth decay. Consumption of sugars in the United States has increased dramatically in past decades, and contributes to an epidemic of gum disease and obesity. According to the CDC, in 2014 a reported 47% of Americans have some form of periodontal (gum) disease. The bacteria that cause periodontal disease thrive in acidic environments. Therefore, eating sugars and other foods that increase the acidity in the mouth increase bacterial counts. Sugar is the driving factor that has the most dental cavity-promoting potential. Sugars, a form of fermentable carbohydrate, are differentiated by their chemical structures: monosaccharides, disaccharides and polysaccharides. Understanding the difference is very important because limiting one sugar over another is essential to healthy eating, hence a healthy mouth and body! 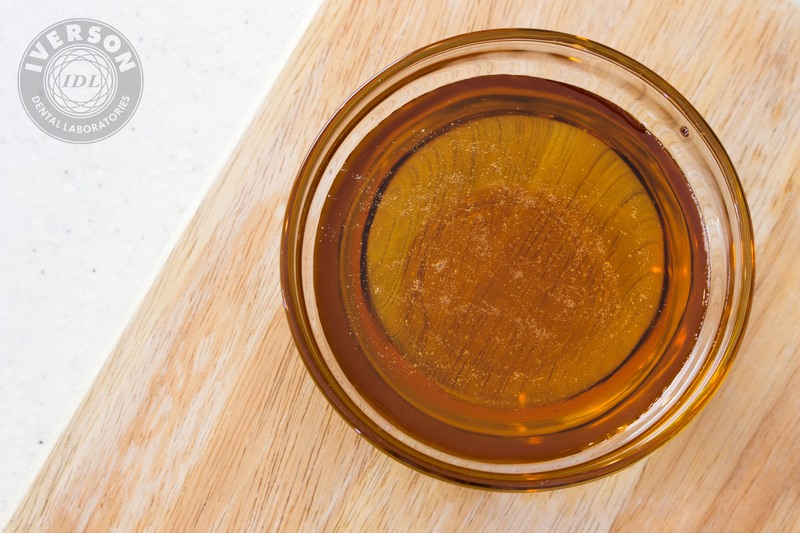 Natural sugar, such as pure honey or unrefined sugar, are the best choices when adding sugar to meals/beverages but has cavity-promoting potential. Monosaccharides are also known as simple sugars, such as glucose, fructose and high-fructose corn syrup, that are carbohydrates made of one molecule of sugar. Monosaccharides should be consumed in the form of healthy foods rather than junk food such as fruit, pure honey, beets, and plain yogurt. Avoiding high-fructose corn syrup all together is best for optimal health because this form of sugar has the highest amount of calories per serving and provides poor nutritional value to one’s diet. Sugar found in dairy products, such as cheese and yogurt, is naturally occurring but still can contribute to tooth decay those found naturally in foods (e.g., fruit, honey, and dairy products). Disaccharides are made of two molecules of sugar and also have dental cavity-promoting potential: sucrose (e.g., table sugar, vegetables, Fruit), lactose (e.g., milk) and maltose (e.g., beer). Starches—such as potatoes, grains, rice, bread, bananas, etc.—contribute to tooth decay because they are fermentable carbohydrates. Polysaccharides also known as starches have 3 or more molecules of sugars. 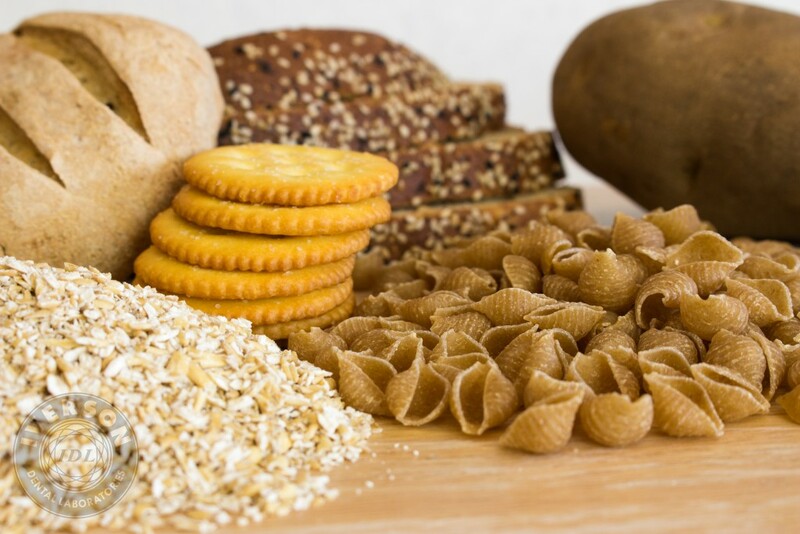 Starches—such as potatoes, grains, rice, bread, bananas, etc.—also contribute to tooth decay and should be considered when taking preventive measures. Although the content of sugars in the diet plays a pivotal role in dental caries patterns, adoption of good oral hygiene habits, a balanced diet, and limited intake of high-sugar between-meal snacks will reduce the risk of caries. Often, eating sugary or starchy snacks between meals can be a problem when they stay on your teeth, as opposed to eating a entire meal that helps to wash away harmful sugar and acids from the teeth. Chewing stimulates saliva production, which subsequently buffer acids, sugars, and food particles away from your teeth. It is also suggested to rinse your mouth with water after ingesting high acidic beverages or consume with a variety of foods to buffer the acid from teeth. Lack of oral hygiene encourages bacterial buildup and plaque formation, allowing sugars and acids to help the bacteria thrive. It’s important to add, individuals with a well-balanced pH level in saliva and good oral hygiene habits pose minimal risk when high acidic foods and beverages are consumed as part of a balanced diet. Sugar-free gum, especially xylitol-sweetened gum, has been clinically proven to reduce the level of bacteria in ones mouth. Sugar-free gums helps increase production of saliva, which contains calcium and phosphates, to help fight off sugars and other fermentable carbohydrates from the teeth and oral cavity1. Xylitol, sorbitol, mannitol, erythritol and isomalt are constructed of multiple sugar molecules that have no caries-promoting potential. Interestingly, xylitol, sorbitol, mannitol, and erythritol are found in small amounts in fruits, vegetables, and exudates of plants/trees (plant sap) therefore are considered natural. The proper diet and nutrition may favor remineralization (minerals that are returned to the molecular structure of the tooth to strengthen it) when they are high in calcium, phosphates and proteins1. In other words, foods high in calcium, phosphates and protein provide the best nutritional value needed to protect the overall health of one’s teeth and mouth. 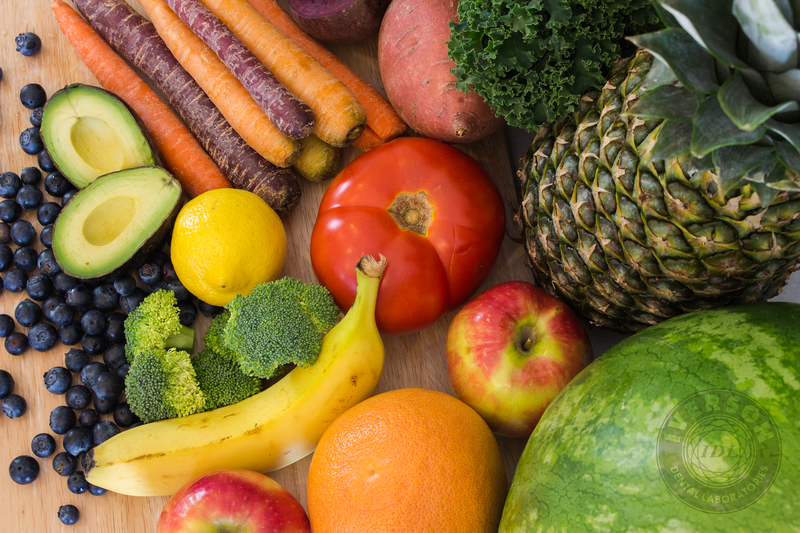 A well-balanced diet, rich in fruits and vegetables, may be able to prevent tooth decay and periodontal disease (gum disease). Fruits and veggies are an important part of any balanced diet that are also good for your teeth. Since they are high in water and fiber, they help to balance the sugars they contain and help to wash away the bacteria from your teeth as you chew. 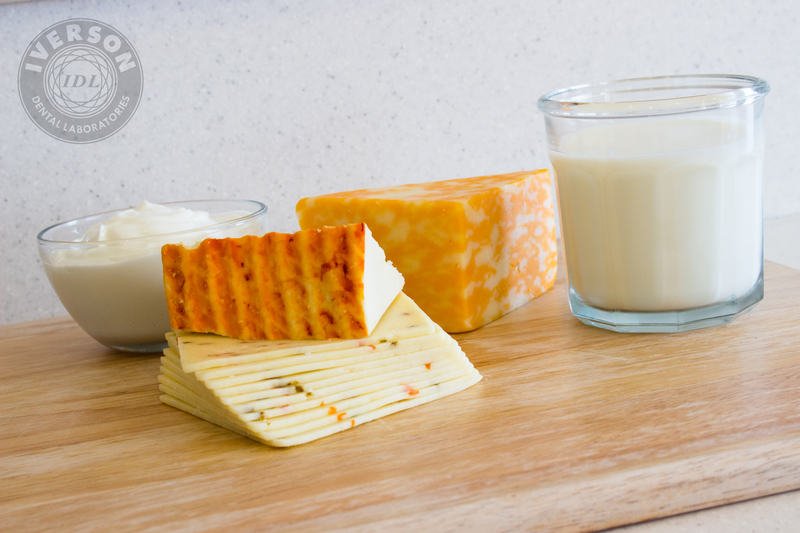 Dairy products such as cheese and yogurt, are low in sugar, which is a good thing for your dental health. Plus, they contain protein and are full of calcium, which can help to strengthen your teeth. Lean proteins such as meat, poultry, fish, milk and eggs help to strengthen your teeth and contain valuable protein and phosphorus. These foods also help protect and rebuild your tooth enamel. 1. Touger-Decker, Riva, and Cor Van Loveren. “Sugar and Dental Caries.” American Society of Clinical Nutrition (2003): 881S-92S. The American Journal of Clinical Nutrition. Web. 26 May 2015. <http://ajcn.nutrition.org/content/78/4/881S.full>. 2. “Top 10 Foods Highest in Phosphorus.” HealthAliciousNess. N.p., n.d. Web. 27 May 2015. 3. “Top 10 Foods Highest in Calcium You Can’t Miss.” HealthAliciousNess. N.p., n.d. Web. 27 May 2015. 4. “Top 10 Foods Highest in Protein to Optimize Your Diet.” HealthAliciousNess. N.p., n.d. Web. 27 May 2015.